Today for #SundaySupper we had to make a sauce of some kind. I asked my Husband what kind of sauce should I make? He said his famous Wally Wing Sauce. I said that’s great, but you have to make it! Well as you can tell from the title of my post, we didn’t make the famous Wally Wing Sauce, since he tends to be a little lazy in the kitchen. I told him the post can be all his, I’ll write what he says and photograph the pictures. No sell! So today I decided to make for the first time ever homemade roasted vegetable pasta sauce. I am soooooooooooo proud of this recipe!!! I haven’t made true slow cooked pasta sauce in a very long time. Normally I will make a meat sauce, but today I wanted a nice roasted vegetable sauce. This recipe is great for using leftover vegetables. The sauce is chock full of every vegetable I had in the fridge. It’s made with zucchini, bell peppers, carrots, onion, broccoli, celery and garlic! Oh baby! Is it ever so good! You can actually taste the flavor of all the vegetables. However I found the zucchini really stood out. I think it’s because I used four medium ones in this recipe. It was either use it or lose it! I cooked the sauce over low heat for almost four hours. The sauce turned out perfect and I couldn’t be more happy with it. It seems like a long time, but the flavors come together so nicely and it really isn’t much work. I stirred it occasionally and went on for the rest of the day. I am sure if you didn’t plan to be home, you could make this in a slow cooker. I just recommend roasting your vegetable ahead of time. You could do that the day before. For my dinner, I served it over a bed of spaghetti squash for myself. I just love spaghetti squash. 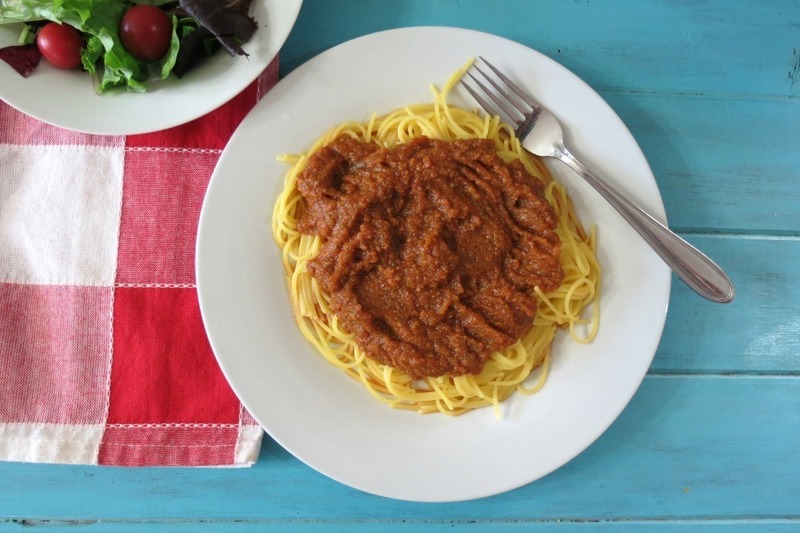 Its low-calorie, low carb and it picks up the flavor of the sauce. My Husband on the other hand had spaghetti with his sauce. I asked him what kind of pasta do you want and he said spaghetti. I looked in the pantry and for spaghetti, all I had was whole wheat or quinoa. Shhhh, don’t tell him but I used the quinoa pasta for his. He had no clue at all! He ate it all. It’ so funny because as you know he doesn’t like quinoa. ha ha Honestly, you can’t tell the difference and his opinion says it all. See it’s white, so he didn’t think anything of it. He does notice whole wheat because of the color! Plus whole wheat does tend to taste a tad grainer. A homemade healthy, slow cooked, thick, vegan, low calorie pasta sauce made with roasted vegetables. Line two baking sheets with parchment paper or spray pans with cooking spray. In a bowl, add vegetables and 1 tablespoon of olive oil. Turn to coat vegetables. Divide vegetables between baking sheets and bake for 15 minutes, flip and bake for another 15 minutes or until vegetables are fork tender. Meanwhile over medium heat, in a large pot add tomatoes, tomato sauce, tomato paste, garlic, oregano, basil and sugar. Once vegetables are done, add it to the sauce. With a immersion blender, puree all of the vegetables with the sauce, until no more chunks remain. Bring to a boil, cover and simmer on low heat for two hours. 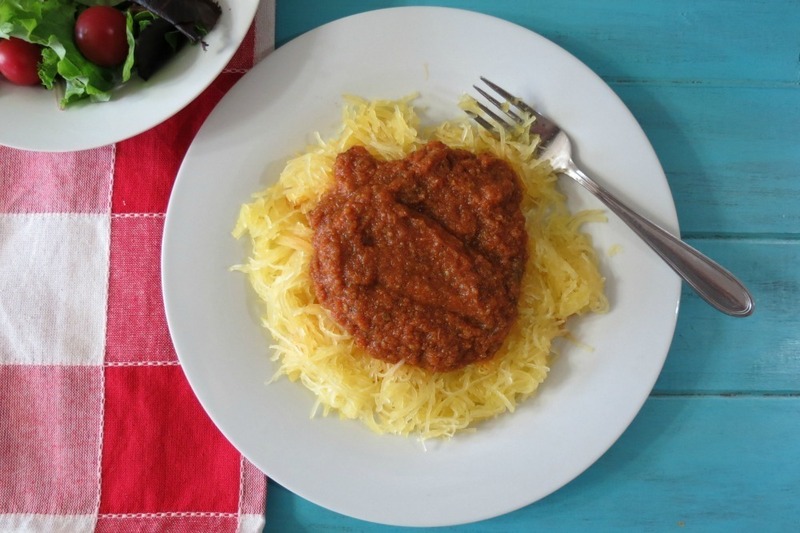 Serve over pasta or spaghetti squash. NOTE: if you do not have an immersion hand blender, puree the vegetables in a blender in batches, than add to the sauce. I just love homemade dishes like this! Nothing more cozy than fresh pasta sauce slow cooking all day and than sitting down to a nice hearty, healthy dinner. Since I had so much sauce leftover, I froze half of it and placed the rest of it in a large mason jar in the fridge. That way I have some for leftovers this week and the frozen is to have later! Have a great Sunday!! I won’t be online too much today since I am heading to Placerville to go to Apple Hill! I can’t wait!!! Oh and be sure to see what fun and creative sauce the #SundaySupper crew made today! Tomato Kasundi from What Smells So Good? Join the #SundaySupper conversation on twitter each Sunday. We tweet throughout the day and share recipes from all over the world. Our weekly chat starts at 7:00 pm EST. Follow the #SundaySupper hashtag and remember to include it in your tweets to join in the chat. Check out our #SundaySupper Pinterest board for more fabulous recipes and food photos. Would you like to join the Sunday Supper Movement? It’s easy. You can sign up by clicking here → >Sunday Supper Movement. Love the depth that roasting the veggies give sauce. This one sounds amazing! Simple, perfect, yum! Thank you so much Shannon! I love roasted vegetables, the flavor really pops! I live roasted sauces!! Yummm! I have soooo much tomatoes left from the garden. I’m learning to can so I can store them. That is so awesome! I would love to can some tomatoes! Nothing like fresh tomatoes or any kind of vegetable from the garden. Oh my goodness – this recipe is incredible. I love roasted veggies and this is a great one for meatless Monday! YUM! Love roasted vegetables. What a great sauce for a meatless meal. I’m on my way up for dinner! Roasting the veggies must give it such an amazing flavour, awesome job. Accidently vegan too, I can’t wait to try it. WOW this sauce sounds AMAZING!! We have been wanting to try subbing spaghetti squash for our pasta, ut I would like to find that quinoa pasta too! You should be able to get quinoa pasta at your grocery store and I know Whole Foods sells it. I buy it online at Swanson http://www.swansonvitamins.com/q?kw=quinoa. 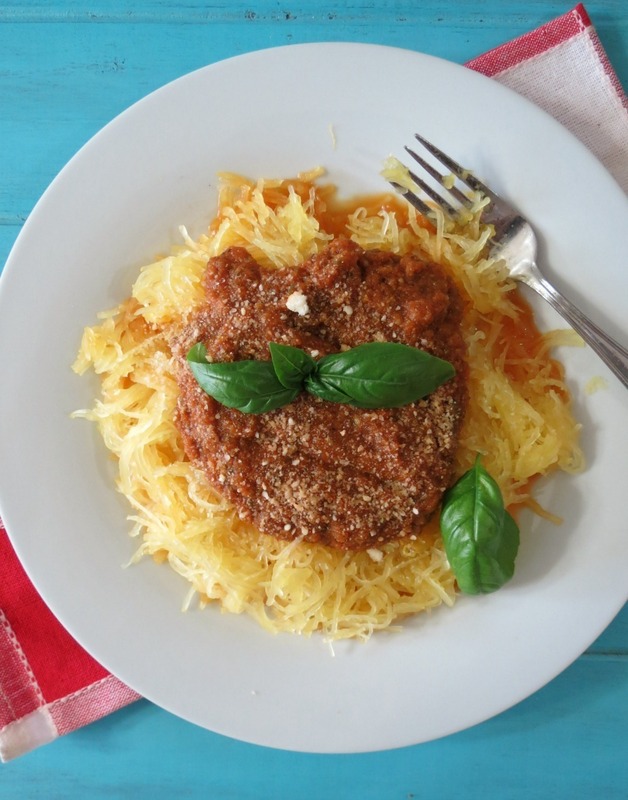 Spaghetti squash is a great sub for pasta! But I’ll be honest, it’s good, but it’s not the same, but I love it! It satisfies my pasta craving. 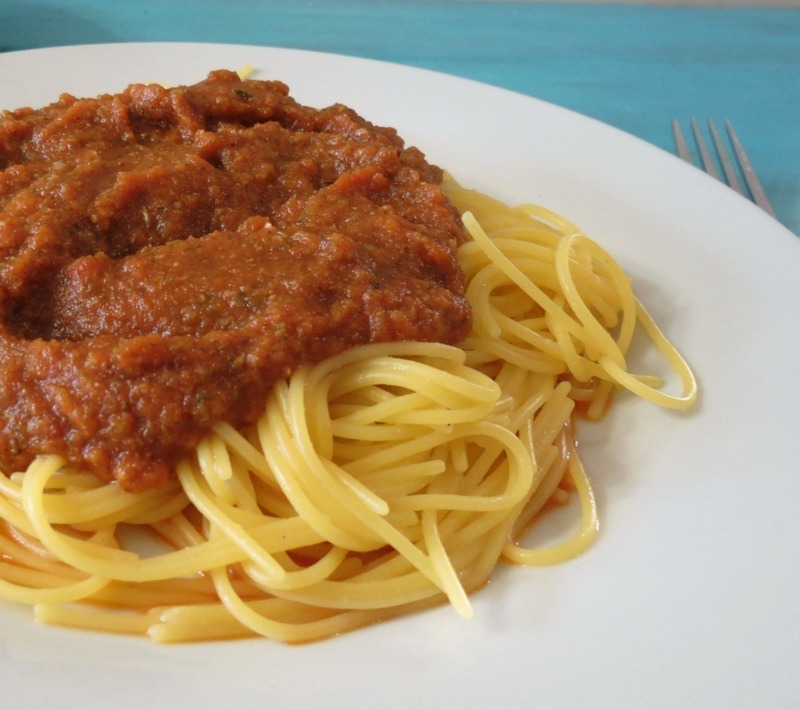 A good, hearty vegetable pasta sauce is perfect for winter! I agree, that’s why I froze half the batch! Your sauce looks delicious but tell your husband he has a request for his Wally Wing sauce. Thanks for participating this week. lol! I told my Husband he needs to make his Wally Wings. Maybe I can get him to do it this coming weekend? 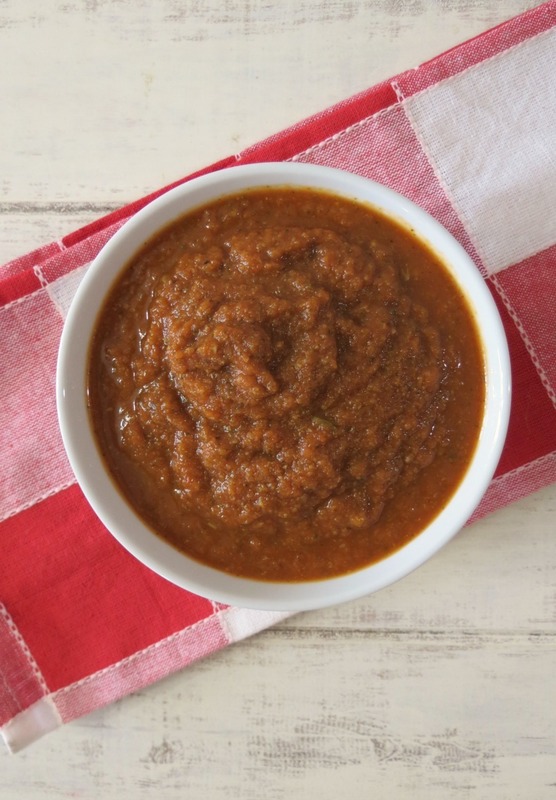 I absolutely love the idea of a roasted vegetable sauce, I have never heard of or tried anything like this! Thank you for sharing!! Your welcome. You should give it a try, it’s so easy and loaded with flavor! 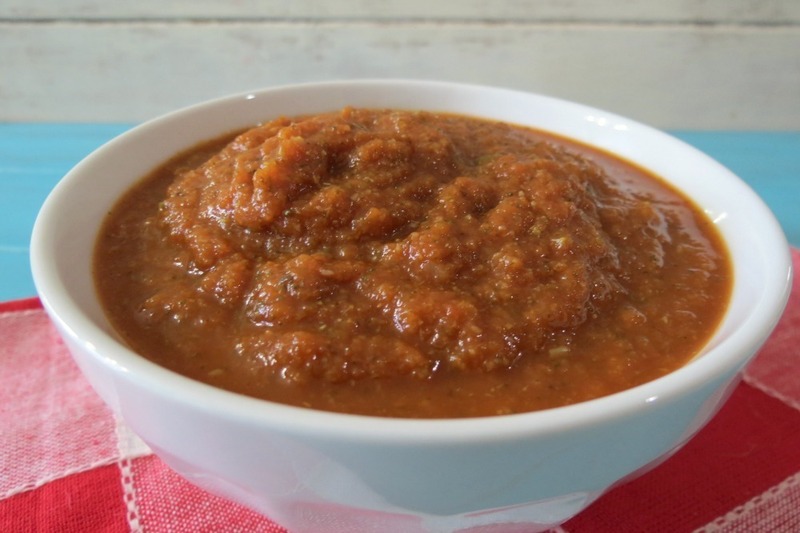 Made this recipe today to use up garden tomatoes – it is delicious! Used all fresh tomatoes, peeled and stewed instead of canned and the flavors are wonderful! Thank you so much for the great post and perfect recipe! YAH! I am so glad it turned out for you and oh my gosh it must of tasted amazing using fresh tomatoes. I love that!! I am envious of you, I wish I had a garden fresh tomatoes. Maybe next year? What a great way to use up what’s in the veggie drawer! And my hubby wouldn’t eat spaghetti squash or WW pasta either! Trick him with quinoa pasta, I don’t think he will know. 🙂 So far mine doesn’t. lol I know making a sauce like this is a great way to use up those veggies. Sometimes I tend to go overboard on vegetables and I have to use them up, and I thought a sauce would be a great way, plus extend the life of my vegetables. This dish is something my daughter would love! 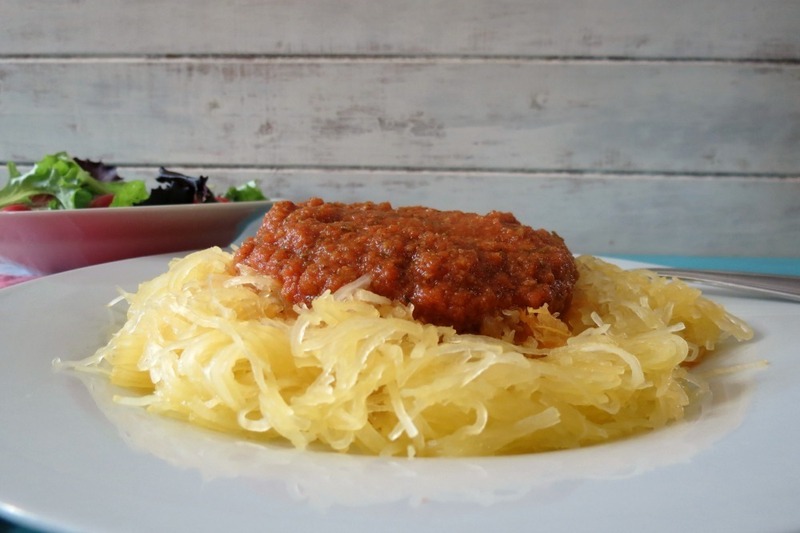 The roasted vegetable sauce sounds amazing and I love that you put it over spaghetti squash. Oh this sounds FABULOUS! I love everything about this. Roasted veggies are the best and I bet they make such a flavorful sauce! Thank you Nicole. I love roasted vegetables. Sometimes I just make a big batch of them and have that for dinner. Love how I could easily sneak some veggies into my daughters pasta!! Never thought to do that! Thanks for the new recipe to try! I think that I’d love this even more than a meat sauce! It’s so easy and good, you should give it a try with your favorite veggies. This looks yummy! I’ll have to try it for a #MeatlessMonday. Awesome idea to do a roasted veggie sauce, you have hit this one out of the ball park!!! Ahhhh, thank you so much Tara!! Magic happens when you slow cook pasta Sauce; your version looks absolutely amazing! Ahhh, thank you so much Bea!! Mmmm…this sauce must be so flavourful, Jennifer! I love when food is delicious AND healthy (a combo that’s rare in my household, lol). I tried this recipe and it tasted amazing! Thank you Samantha! I am so glad you liked it! 🙂 Thank you for letting me know. Enjoy the rest of your weekend!